Things are tough all over, so instead of ordering out, I made a cheap frozen pizza for dinner. You know the type: basically a large round Elios-type crust pizza, packaged in twos. I stood in the kitchen and looked at this thing and tried to figure out what to do to jazz this boring pizza up. 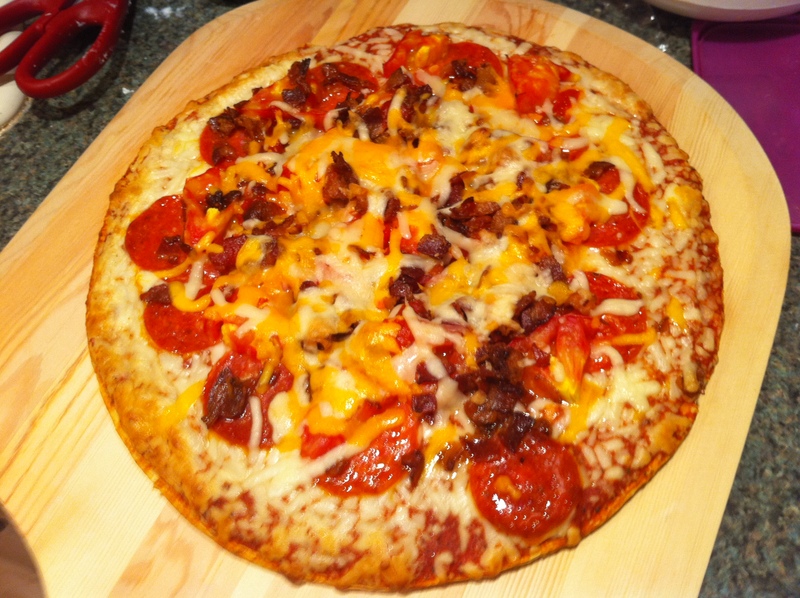 First I put a round of pepperoni on, and then I chopped up a giant heirloom tomato and stuck that on there as well. I had some leftover chopped up bacon so I threw that on and grabbed the bottle of Sriacha to splash that all over. Who doesn’t love heat on thier pizza? Ok, maybe not alot of people, but I do. I had a handful of cheese, threw that on and popped it in the oven at 400 degrees on the pizza stone. The tomatoes were juicy and hot, the Sriacha made it’s way all over the pie, the cheese wasn’t overdone and even the crust, which, if you remember, is just crappy Elios type cardboard crust, wasn’t too bad, it held together and didn’t fall apart with the weight of all the toppings. Overall, it was delicious and is helping me stay concentrated on making Pierogie filling and my fantasy football draft!